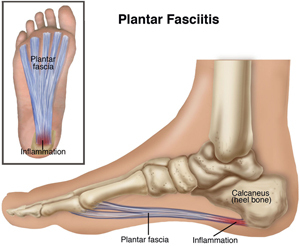 Plantar fasciitis may be the most common cause of heel or bottom of foot pain. It is common among runners and athletes due to the repetitive stress on the feet with running, sprinting and jumping. It may also occur after wearing footwear with inadequate support, or when you have a change in daily tasks (e.g. starting a new job where you’re on your feet most of the day when you were previously at a desk job with mostly sitting). It may also be a side effect of tight calf muscles or Achilles tendon as this would create greater pull on the heel bone. Wearing high heel shoes can be a factor in the development of plantar fasciitis. Those with either particularly high arches or particularly flat feet may also be at greater risk for developing plantar fasciitis. Whatever the case may be, the repeated stress and strain on the plantar fascia causes an inflammation of the fascia itself. Pain in the heel or bottom of the foot is the major symptom of plantar fasciitis. It is pain that is usually localized to one spot and is tender to the touch. Pain is likely worse in the morning after the first few steps out bed and eases up as the day goes on. 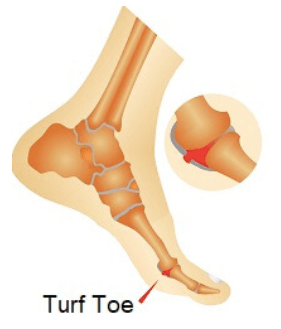 It is important to note here that if the pain is excruciating and you cannot put weight on your foot, it is a good idea to seek out an x-ray or doctor’s assessment to rule out stress fracture. If you are able to bear weight and walking makes it better, it may be more likely that are you are dealing with plantar fasciitis. Treatment is likely to include exercises to loosen the calf muscle and stretch out the plantar fascia. Something simple such as flexing and pointing the feet a number of times before getting out of bed can help. In the image above, the patient is shown stretching the bottom of the foot. This is done by flexing the foot (and stretching the Achilles tendon) and also flexing the toes. By flexing the toes, this creates a deeper stretch along the bottom of the foot. Anything that stretches out the calf muscles is also a good idea. If stretching alone is just not cutting it, try using a foam roller to roll out your calf muscles and a golf ball or foot roller (which can be found at many dance shops) to help ease the tension on the heel bone (i.e. the calcaneous). You can also see your massage therapist to have them work on that tension. If you usually wear high heels, try wearing ballet flats or a lower heel until pain subsides. If your shoes are worn out, invest in a more supportive pair. Or if new shoes aren’t in the budget, try using an arch support from the drugstore in your old shoes and see if it makes a difference. Use ice on your heels at the end of the day to try to decrease inflammation. And as usual, come see your physio or RMT for more specific recommendations because being on aching feet all day is not fun. Muscle cramps (including the foot) are extremely common; in fact, according to MedicineNet.com, it is estimated that 95 percent of people experience a muscle cramp at some time in their life! There are many causes and treatments of muscle cramps, so if you are interested in learning more, keep reading! The American Academy of Orthopaedic Surgeons defines a muscle cramp as an involuntary and forcibly contracted muscle that does not relax. Cramps can affect any muscle under voluntary control (skeletal muscle). Cramps can involve part or all of a muscle, or several muscles in a group. 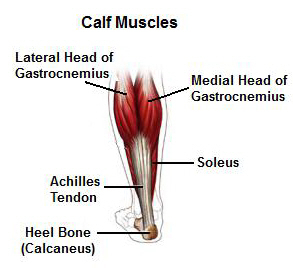 Cramps of the extremities, especially the legs and feet, and most particularly the calf, are extremely common. Other common areas for muscle cramps include: back and front of the thigh, hands, arms, abdomen, and rib cage muscles. So, who gets cramps? Like I said earlier, statistics show that just about everyone will get some type of muscle cramp during their lifetime. They can come at any time too, with exercise or activity, or even when at rest or during sleep. Sometimes all it takes is the slightest movement that shortens a muscle to trigger a cramp (in your case, pointing your toes in Pilates shortens the muscles of the arch of your foot, which seems to trigger the cramps). According to the American Academy of Orthopaedic Surgeons, some people are predisposed to muscle cramps and get them regularly with any physical exertion. Muscle cramps are very common among endurance athletes who perform strenuous physical activity. Those at greatest risk are people over age 65, those who are ill, overweight, overexert during work or exercise, or take certain medications. Common causes of muscle cramps include: overuse of a muscle, dehydration, depletion of salt and minerals (electrolytes such as magnesium, potassium and calcium), muscle strain/injury, or simply holding a position for a prolonged period of time. Another type of common muscle cramp is a nocturnal or rest cramp, which happens in your calf or toe muscles when you are resting or sleeping. However, the exact cause of muscle cramps remains unknown, although some researchers believe inadequate stretching and muscle fatigue leads to abnormalities in mechanisms that control muscle contraction. In terms of treatment for muscle and foot cramps, you can generally treat muscle cramps with self-care measures, and most cramps can be stopped if the muscle can be stretched. For many cramps of the feet and legs, this stretching can be done by simply standing up and walking around. Typically, you want to try and gently stretch the muscle away from the cramping position and hold it there until the cramp goes away. Gently massaging the muscle will often help it to relax, as will applying warmth from a heating pad or hot/warm soak. If the muscle cramp is associated with fluid loss, as usually is the case with physical activity, fluid and electrolyte replacement is essential. There are a few steps you can take to prevent muscle cramps. Avoid dehydration by drinking plenty of liquids every day and during physical activity, replenish fluids at regular intervals and continue hydration after you’re finished. Also, stretch your muscles before and after you use any muscle for an extended period. If you have night cramps, stretch the affected muscles before bedtime. Although most muscle cramps are benign, sometimes they can be an indication of a more serious medical condition. You should see your physician or medical health professional if the cramps are severe in nature, happen frequently, are persistent, fail to respond to simple treatments, or are not related to obvious causes like exercise or injury. You could have problems with circulation, nerves, metabolism, hormones, or nutrition. However, it is uncommon for muscle cramps to occur as the result of a medical condition without other obvious signs that the medical condition is present.